1856. Money. Some need it more than others. David and Hannah work in Paisley’s textiles industry, long hours with poor pay and a baby on the way. With barely room in their home for Hannah’s pirn winder, their relationship is tested and strained even more when David decides to join the weavers’ protest for rightful compensation for the ‘sma’ shot’ used by him and his fellow workers to bind the weft and warp threads. 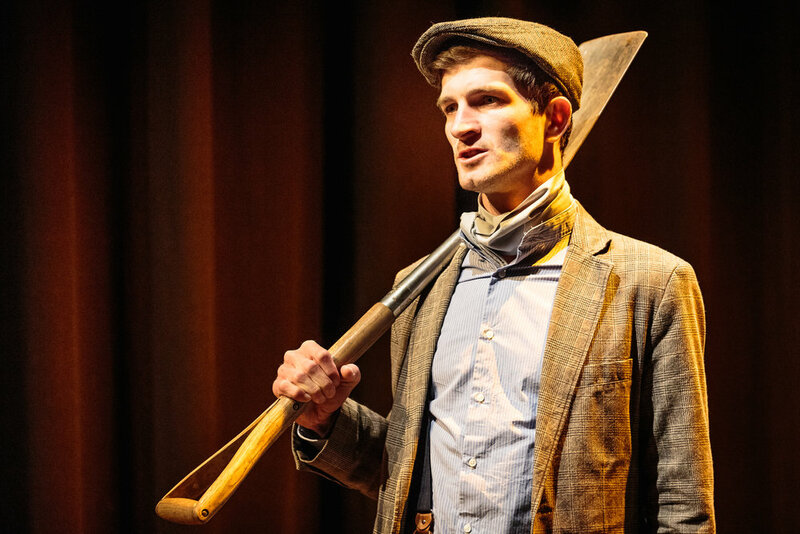 Necessity becomes the mother of strife as the young couple find themselves caught in a game of stick or twist – the dealer in this game the mill foreman, whose interventions range from persuasion and intimidation to the old-fashioned tactics of divide and rule. Silver Threads is a quick-fire comedy about love, work and rights, set to the background sound of street protests and the Charleston drum. The play, written by Paisley-born comedian Bruce Morton, celebrates the weavers’ victory of 1856 with satire, songs, images and audience involvement to take a wry and riotous look at working practices then and now. Performed by Bruce Morton, Clare Gray and Neil Leiper, with Anna Kiakowski and Khumbo Misanjo.